A single referral for clinicians, online registration and single 75-minute visit to aggregate and summarize an individual's entire medical history and provide a detailed snapshot of their current health. Our platform is HIPAA compliant and our check-in process is anonymous. In addition to the Q Report, the Q BioVault also includes raw results and pre-processed data. Integrated bioinformatics automatically surface the most salient changes in an individual based on their current and future health risks by correlating across a wide variety of data sources. Q delivers insights without drowning you in data. 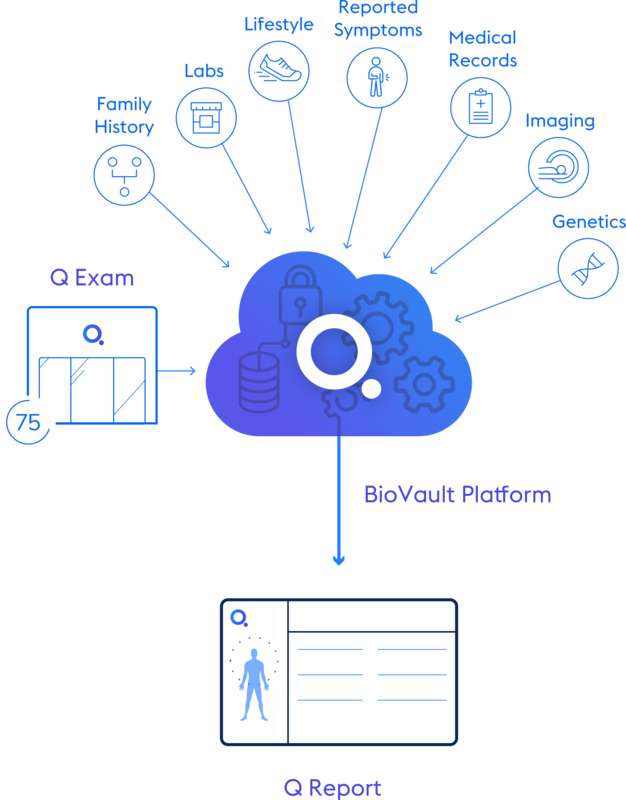 BioVault quickly analyzes new biomarkers as they are available and incorporates new medical knowledge to stay on the cutting edge and evolve with the Q Exam. The Q exam protocol is IRB approved and was designed and reviewed in collaboration with clinicians and researchers with the goal of identifying pathology at early stages across five categories of common existential risks. The Q exam protocol is built on non-invasive measurements that are clinically relevant, based on the latest peer-reviewed literature. These measurements are tested and selected based on their quantitative accuracy and reproducibility to maximize longitudinal value. Q collects data with clinical trial standards that require independent certification of our technicians.